It has been a beautiful Autumn weekend. We slept well in the cool night, enjoyed the first Sugar Baby watermelon with grapes and zucchini fritters for lunch, and felt very lucky to be here. Monarch butterflies are floating around and the bees are enjoying the late summer flowers. The vegetable garden is doing as well as can be expected, so I concentrated on planting the first of my bulb orders in this perfect sunny weather. The full moon rose as orange and round as one of these calendulas last night, although I was thinking of sunshine as I picked them and the California Poppies at the end of the day. 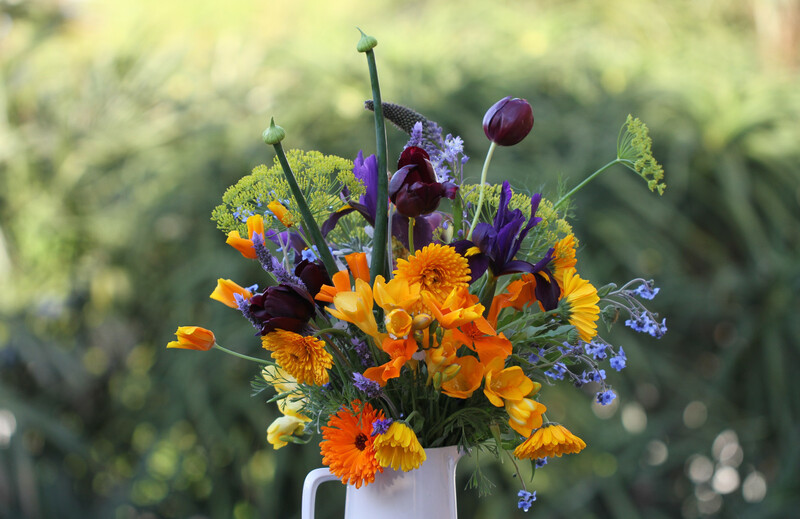 California Poppies, Calendula, Cynoglossum, and Dill sow themselves around the garden if they can find a nice place. I sometimes take them for granted, but I’m very grateful for them. I wondered if Asahi tulips were named after a beer, for their lovely golden tones, but no. Much more appropriately it’s ‘morning/rising sun’. And they are absolutely stunning seen in the early morning with the sun shining through them, but I was too busy running until the sun was setting, so here they are in the last light of day.